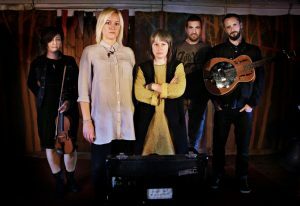 Stick In The Wheel are “ripping apart the preconceptions surrounding folk music” (Clash Music). Their now-trademark abrasive delivery of both original and traditional tracks, is not bland retroism, or empty nostalgia, but a voice linking now to then. Brought up in the thriving culture of working class London and cutting their teeth in its diverse musical landscape, they now bring those influences and attitudes to their traditional music. Stripped back to their bare components, their songs speak for themselves without ornament, telling tales of everyday life: carboot-swindlers, lorry drivers and London rioters, sitting seamlessly against traditional songs of prisons, hammer-wielding blacksmiths and 17th century madhouses. Magazine, Record Collector and appearances on BBC Radio 4’s Woman’s Hour, BBC Radio 3 Late Junction and BBC Radio 2’s Folk Show.